Brief：Chinese President Xi Jinping arrivals in Mongolia for visiting today.Xi and his wife Peng Liyuan were greeted by Mongolian Prime Minister Norov Altankhuyag and his wife at the airport in Ulan Bator. 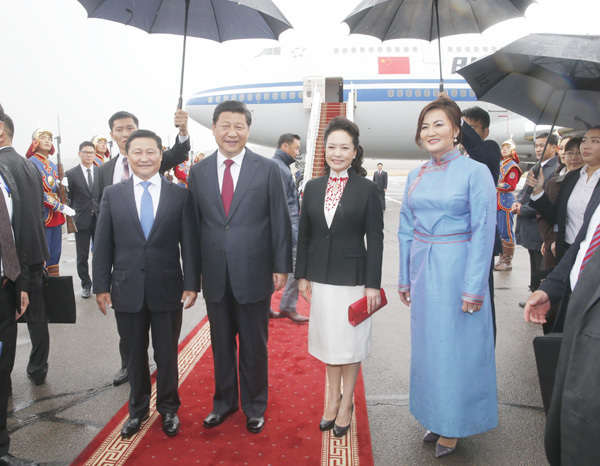 Chinese President Xi Jinping arrived in Ulan Bator Thursday for a two-day state visit to Mongolia. It was the first visit in 11 years by China's head of state to Mongolia, and also the second time for Xi to make a one-stop trip to a foreign country since he took office in March 2013. Xi and his wife Peng Liyuan were greeted by Mongolian Prime Minister Norov Altankhuyag and his wife at the airport in Ulan Bator. Xi said China and Mongolia are close neighbors who are linked by mountains and rivers and boast profound friendship. "I believe my visit will be a trip of friendship, cooperation and development that bears the anticipations of both peoples," he added. The Chinese president said his trip to Mongolia is like "visiting relatives" and he is very delighted and full of expectations. "I hope to take this visit as an important opportunity to elevate the bilateral relations to a new height," he said. Friendship and cooperation has been the theme of China-Mongolia relations since the two countries established diplomatic ties 65 years ago, Xi noted. "The constant deepening of strategic mutual trust, the growing converging points of our interests, and the increasingly closer sentiments between the two nations are valuable assets accumulated jointly by the two peoples," Xi said. China and Mongolia, which share a borderline of more than 4,700 km long, should be good neighbors in action and friendly neighbors in emotion, in addition to being close neighbors geographically, he added. The Chinese people are striving for the Chinese Dream of national rejuvenation, and the Mongolian people are also forging ahead in their path of reform and development, Xi said. The two countries enjoy converging points in strategy and complementarity in economy, and the two peoples boast long-standing friendship and deep-rooted amity toward each other, he said. "We are blessed with good timing, geographical convenience and harmonious human relations when we continue to deepen and develop our friendship and cooperation," Xi said. "China and Mongolia are now standing at a new historical point in growing their relations," he added. The two countries should become strategic partners who are reliable and responsible, reciprocal partners who are willing to share with each other and seek mutual benefits, friendly partners who can open one's heart to the other and often visit each other, and cooperative partners who can join hands and work to promote peace, Xi stressed. "We have reason and confidence to expect that the China-Mongolia relations will embrace an even brighter future," Xi said. Xi is scheduled to hold talks with his Mongolian counterpart Tsakhiagiin Elbegdorj and meet other leaders of the country. He will also deliver a speech at the State Great Hural of Mongolia, the country's parliament. This year marks the 65th anniversary of China-Mongolia diplomatic ties, the 20th anniversary of the revision of the Treaty on Friendship and Cooperation between China and Mongolia, and it happens to be the China-Mongolia Friendship and Exchange Year. Analysts believe Xi's visit will boost the strategic partnership between the two neighboring countries. China has been Mongolia's largest trading partner and a major investor for more than a decade. 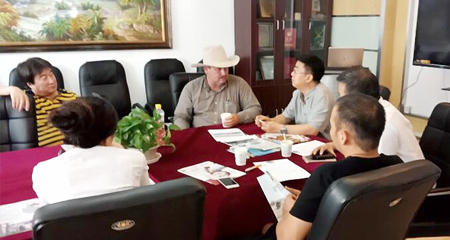 The two-way trade volume between China and Mongolia stood at only 324 million U.S. dollars in 2002, and has rocketed to nearly 6 billion dollars in 2013, accounting for more than half of Mongolia's total foreign trade.